For my birthday I got a shiny new overlocker and it’s only really been this weekend that I’ve managed to have a proper play with it. 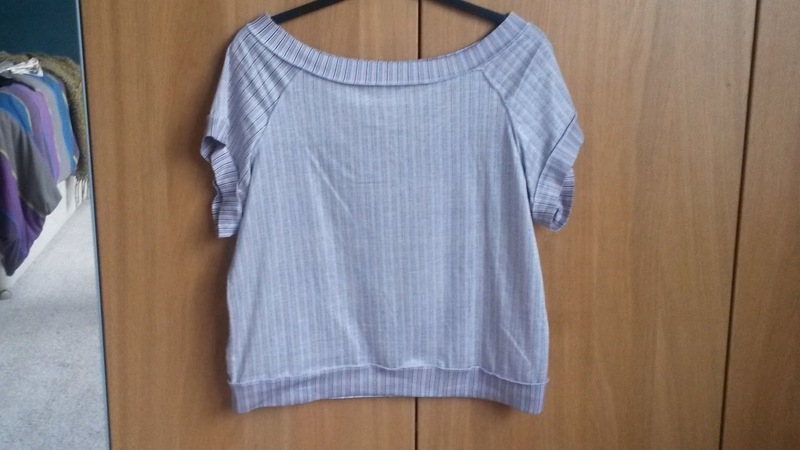 I really wanted to make something that only required the overlocker and not the sewing machine. 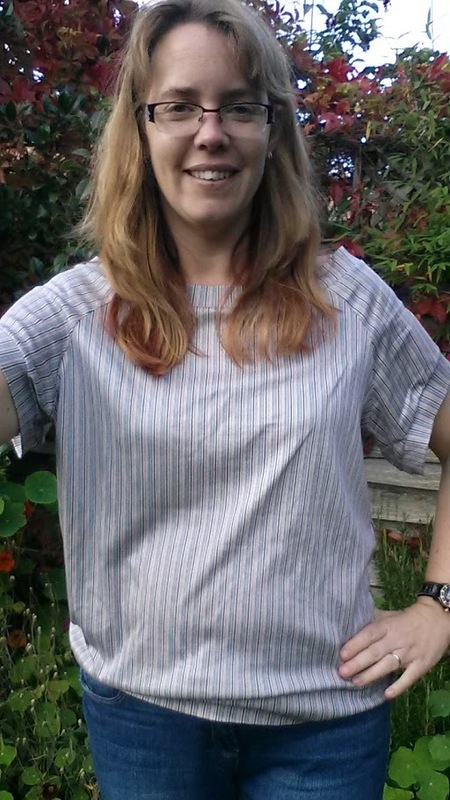 Enter Simple Sews jersey top that came free with issue 17 of Love Sewing magazine. I cut the pattern on Wednesday night and finally got to sew it up yesterday which was a little frustrating that I had to wait so long. 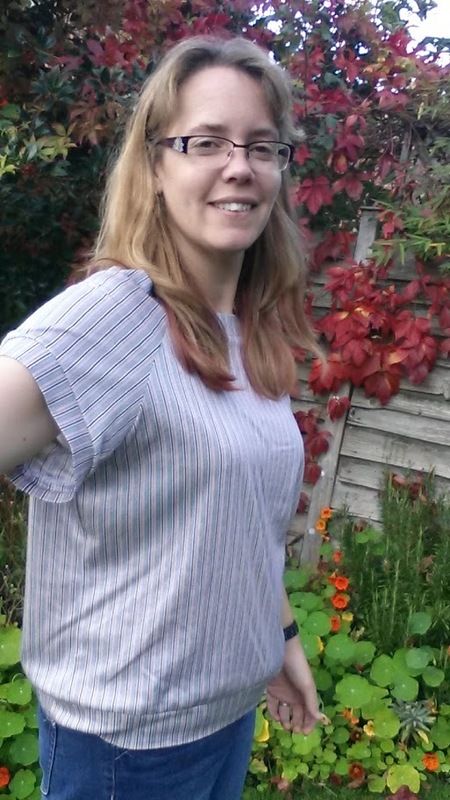 Once I started sewing, I couldn’t believe how quick it was – I’ve never completed a project in so little time! The fabric was given to me from my mum who had it in her stash for years (or possibly decades). It’s a jersey knit with a vertical stripe. She gave me about 7 metres of the stuff although it’s not very wide. Plus there’s a rather strange blue stain running along a considerable length of the fabric, which unfortunately is near the fold. We’re at a bit of a loss as to what’s caused it. Still, it’s all free fabric for me! 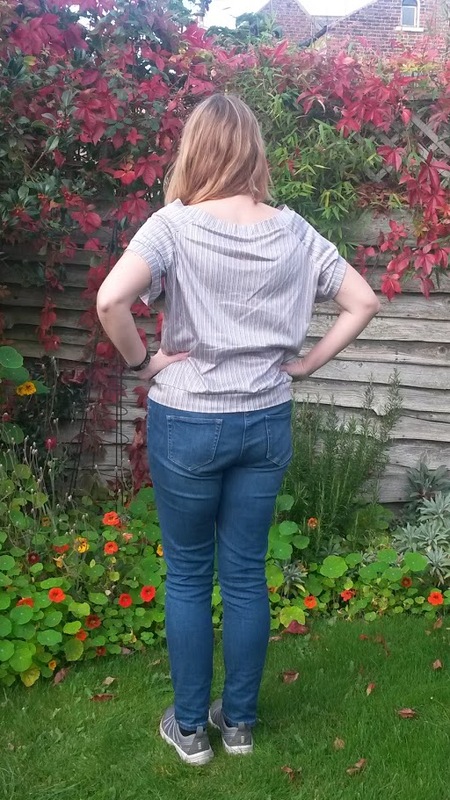 back view – my photographer didn’t tell me it had got so wrinkly! Close up of overlocked seams – I can’t believe how neat it looks! I really like my new slouchy t-shirt. I love the professional finish the overlocker gives it. I also love the fact that you only need to go down each seam once! I also love the fact that the top cost me £0! Doesn’t get better than that! 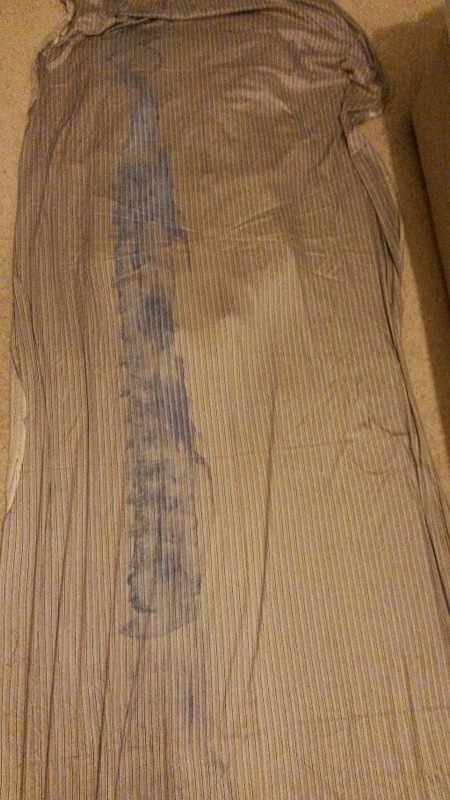 Now, what else can I overlock…..
That was quick work! Looks great on you. Thanks very much! It was so quick, and so much fun! I think you may be right although I still haven’t changed the thread or touched the tension dials yet! All in good time..
Well done!! The finish on the inside is so neat. 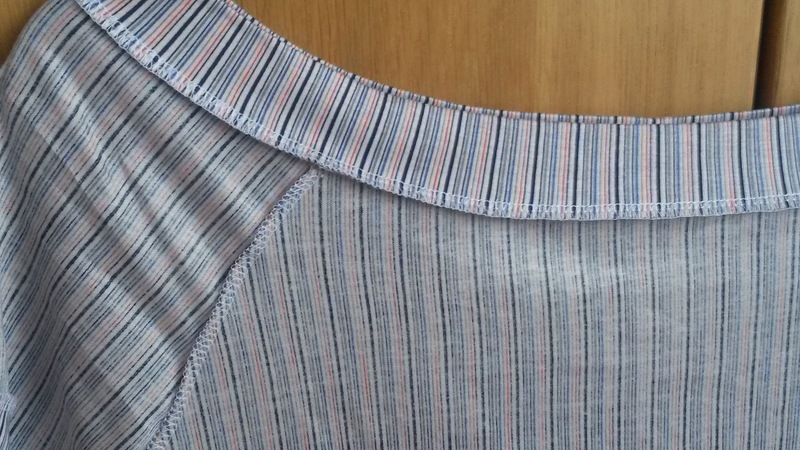 My new overlocker is now out of the box but I was finishing a party frock (soon to be blogged about) and just didn’t have time to devote to the learning process. I must get on with it, I have a piece of cheap and cheerful jersey to practice on. Well done on being so restrained and finishing off your party frock first. I’m looking forward to seeing how you get on with your overlocker. Do you know what you’re going to make yet? Looks good! I bet it was an easy sew! I am so jealous of your new machine. Mine has quite a few years on it, although it still does work. I’m sure you’ll make a lot of wonderful things with it! Thank you! It was so easy and I’m itching to get going again. I’ve been very jealous of other people’s overlockers for years so it’s so nice to finally have one!